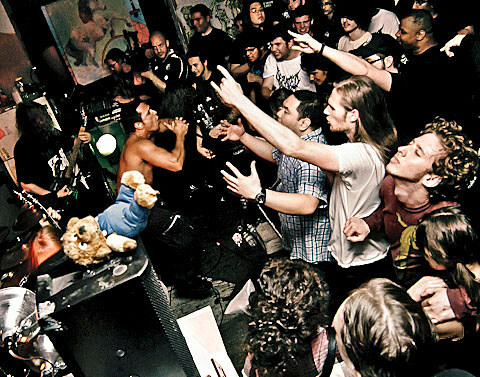 New York City is developing a solid crop of small underground metal festivals. Martyrdoom is heading into its third year, and New York Death Fest has just announced that it’ll return for a second installment. This year’s edition will take place at Saint Vitus Bar on July 26, and it’ll be an all-day affair — the Facebook invite suggests that it’ll run from 2pm until midnight and that 20(!!!) bands will play during that span. Better hope that all those death metal drummers practice breaking down their 15-piece kits quickly. Most of the ten bands announced so far are regional concerns, but there are a couple really notable acts slated — chiefly German tech-death monsters Defeated Sanity, who are one of the most compositionally zany bands in the genre and one of the only death metal bands ever to feature a father-son musician team. (Wolfgang Teske, father drummer Lille Gruber, played guitar in the band for 14 years before dying of cancer in 2008.) Also of note are Spain’s long-running Gruesome Stuff Relish and California’s excellent Portal-esque grinders Plague Widow, who are putting in their first NYC appearance.